American Girl Nicki Doll with Horse Jackson, and 5 Nicki Outfits! With Jackson, the Horse with Saddle and Stirrups. Nikki comes with her meet outfit of white shirt with leotard bottom, belted skirt and boots, she also has her cowboy hat In addition to that Nicki has all of her original outfits Her Ranch Outfit (no bag) Her Tie Top and Shorts Outfit Gala Outfit Ski Wear Ski Gear (missing Start Flag). Jackson has a few little minor scratches and a faint spot on his back. Her white shorts have a faint tan stain on the back it may wash right out. Nikki is pretty clean but there is a little "extra" color in the lip area and her nails have faint pink nail polish on them. You may be able to get both of those out. Her hair is nice, she has long strings and her limbs are tight enough to hold poses and stand There are a few flaws as noted overall this set is in very good condition. View My Other Items For Sale. If you have a special request ie. I sell primarily dollhouses, dollhouse items, dolls, and other toys. Sometimes one of my listings may contain items that have very small parts. Please remember to keep them out of reach of babies or toddlers, and pets who put things in their mouth. Show off your items with Auctiva's Listing Templates. The item "American Girl Nicki Doll of the Year 2006 w Horse Jackson & all of her Outfits" is in sale since Wednesday, May 31, 2017. 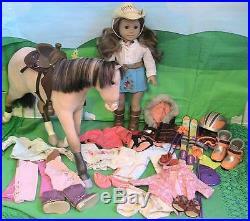 This item is in the category "Dolls & Bears\Dolls\Clothes & Accessories\Modern\American Girl". The seller is "muffin5306" and is located in Philadelphia, Pennsylvania.